▶Extra large size: 200 × 200cm (78.7 × 78.7 inch), large enough space for 3-4 person sit on it. Ideal for family trip, let you and your family enjoy the glamour of nature. ▶Ultra Durable Material: 3 composite layers, soft flannel surface,2mm padded foam and the bottom covered with PE aluminized film works well for heat resistant, tear resistant. ▶Waterproof and Sandproof: The blanket bottom made of non-toxic aluminum material which waterproof and sandproof. Great for use on the grass and sand, keeping you dry, clean and comfortable and shake off the sand easily. 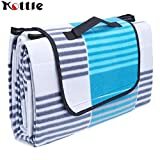 ▶Easy to Fold and storage: Kottle blanket folds up to a 40 x 25 x 12cm compact for easy storage and carry to anywhere, saving space. ▶Wide Usage for Daily, It can be used as a park picnic, camp out, travel, beach blanket, floor mat etc. You can just use it in any way that can plays its advantages. Enjoy it at home:It can be your floor mat, play mat or yoga mat, large space fits up 2-4 person to comfortable relax sit on it or lie down. Enjoy it outdoors:Perfect for park picnic, beach days. Lightweight and Ultra Compact design, easy to carry anywhere. Take your family, friends and our picnic blanket to enjoy the time outdoors. ▶Top Layer: Please slightly clean with warm water and mild soap use brush. ▶Bottom waterproof layer: just wipe clean with damp cloth. ▶Not Machine Wash or dry clean.